We have a mailing list of people looking for the different forms of this dog. 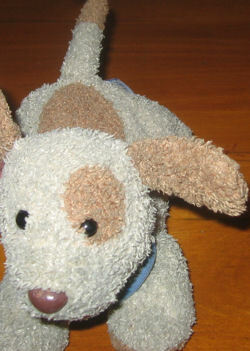 I’m looking for a Carter’s “Dog Gone Cute” puppy dog plush animal. It is just a plush, not a rattle, no music. It is mostly tan with light brown markings: ears, eye patch, 1 spot on top of back, tip of tail & paws. It has beans inside. It has a tan collar with the “Dog Gone Cute” on it. It is about 9 inches from nose to tail. My daughter got this puppy from the baby shower we had. She became attached about a year later. This puppy has traveled with us, moved homes, met new friends and has been a constant friend to her for 7 years now. Our current puppy is starting to fall apart. He lost his nose, his ears are starting to come off. My daughter is heart broken, insisting she can not sleep without her beloved puppy. Did you ever find the dog. I saw one just like this in a goodwill in Miami. Plush version. NOT THE MUSICAL ONE. This one has a tan collar.